We’d love your help. Let us know what’s wrong with this preview of Voices from the Titanic by Geoff Tibballs. To ask other readers questions about Voices from the Titanic, please sign up. This review has been hidden because it contains spoilers. To view it, click here. There are many worthy books about the Titanic. This is one of them. Maybe more worthy than most because it involves many, many first hand accounts not only of the passengers but the passengers of the Carpathia, the ship that rescued the survivors of Titanic. The truth is that to have a full sense of the Titanic disaster just one book isn't going to do it. In addition to this book you need to have at least one more, one with old photos, new photos of the wreck site as well as photos of some of th There are many worthy books about the Titanic. This is one of them. Maybe more worthy than most because it involves many, many first hand accounts not only of the passengers but the passengers of the Carpathia, the ship that rescued the survivors of Titanic. The truth is that to have a full sense of the Titanic disaster just one book isn't going to do it. In addition to this book you need to have at least one more, one with old photos, new photos of the wreck site as well as photos of some of the recovered items. No, I can't recommend one, there are at least a few out there and finding the right one for you is worth your while. The book starts around the time of the launch of the Titanic giving details about it. A large chunk of the book gives accounts by passengers of the Titanic from the time of the boat being struck until being rescued and odds and ends. It quickly becomes clear that most involved with the Titanic from the passengers to the crew and those of the White Star Line that owned Titanic were overconfident feeling that the Titanic could not be sunk. Many didn't take the danger seriously or did when it was too late to leave the boat because all the lifeboats had been deployed. Also clear was that it was chaos, very disorganized. And that the tragedy displayed the best and worst of people. So many of the dctails are just hard to read and harder to fathom. The accounts from the passengers of the Carpathia were nothing I'd heard before and were interesting. Accounts from the Titanic sing the praises of the crew and passengers and the help they gave. I liked that the book did not end there. It carries on to detail to some degree the aftermath of the sinking. Strangely, some early reports said the Titanic was damaged and was being towed to port. No idea where that would have come from or how. And there was chaos about the fact that the Titanic had sunk; misinformation, no information, the right hand doesn't know what the left is doing. I think this book is a must read for those interested in maritime history, the Titanic, history, etc. In fact, this may be a book to add to your personal library. There could be no second opinion about the significance of eye-witness accounts, be it the biggest maritime disaster in human history or be it anything else. Being a Titanic-buff, I can tell you that most books, written on the topic, don't exactly quote or narrate authentic stories. As with historic events, much of it are romanticized. However, this was pretty different from the others in that one will find eye-witness accounts and such from authentic sources. Having said that, there's another bi There could be no second opinion about the significance of eye-witness accounts, be it the biggest maritime disaster in human history or be it anything else. Having said that, there's another big problem that comes with eye-witness accounts. As expected, sometimes the witnesses exaggerate the original event. All things considered, I like the way the book is structured. It tries to, as much as it possibly can, tell you the story truthfully. The newspapers don't control how the stories are told, but they do control how they're running it in their publication. So in that sense, the author tries his best to give all sorts of references a reader may want to know. First hand accounts of a tragedy that still generates as much interest as it did on April 15, 1912. 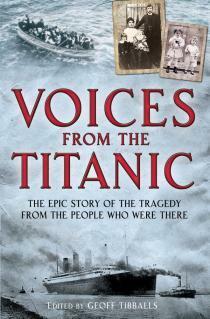 A heartfelt story about the Titanic with much of the narrative being first hand accounts of the survivors. Although I found this book completely heartbreaking, I found at times reading very similar accounts over and over again took away some of the meaning as (awful as this sounds) I began to get a bit bored of it. However, as the book contained so many first hand accounts I could really get a sense of how emotional and scary it was. 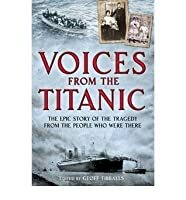 I found it extremely sad how so many lives could have been save A heartfelt story about the Titanic with much of the narrative being first hand accounts of the survivors. Although I found this book completely heartbreaking, I found at times reading very similar accounts over and over again took away some of the meaning as (awful as this sounds) I began to get a bit bored of it. However, as the book contained so many first hand accounts I could really get a sense of how emotional and scary it was. I found it extremely sad how so many lives could have been saved by filling up lifeboats and if the Californian had come to the rescue. I got a real sense of how hard it was for the passengers who were sat in lifeboats to listen to the cries of the dying knowing that if they went to the rescue they may have been killed themselves. The chapter about bringing the dead home was very emotional and at times I had to gulp down the tears. A Wonderful and Important book containing personal anthologies of the disaster from a number of fascinating perspectives. Although I agree with some of the other reviewers that the repetitiveness of some of the accounts led me to skip pages at times. Nonetheless each individual account deserves to be recorded, and here it is done. After reading this book I watched 'A Night to Remember' and was pleased to see that many of the first-hand accounts of events were honoured in the film. I recommend bot A Wonderful and Important book containing personal anthologies of the disaster from a number of fascinating perspectives. Although I agree with some of the other reviewers that the repetitiveness of some of the accounts led me to skip pages at times. Nonetheless each individual account deserves to be recorded, and here it is done. Quite hard going at times but felt obliged to read all the personal statements in honour of each person. The enquiry reports were insightful. Brings a reality to a well known story and puts a human face to the stories told. I've read another book that is a more objective view and the mix of the two books has given me a much better understanding. A harrowing book detailing the tragedy of the Titanic. Repetitive throughout and I did find myself skipping large chunks. However, the lifeboat stories were fascinating and my heart went out to all on board the doomed ship. We all know the Titanic story thanks to countless films etc but this gave a little more insight into what actually happened that night. this book was an emotional read. actually reading the real eyewitness accounts before during and after the sinking of those that were there and how the press reported it all at the time really makes it feel more real. what these people went through and how brave they were is really amazing. I've been looking for something like this all my life! Real Accounts of what happened to the most tragic event in history (For me) are compiled and surprisingly turned into one big book of love, hope, sadness, drama, and of course, tragedy. FOR TITANIC FANS, this is A MUST! Fascinating read. Looks like the film depicted the events of the evening very closely which is good to know. There's a certain amount of repetition in the book where the same events are told by different people but I highly recommend it to anyone who is interested in the Titanic. Probably good for historians, but reading essentially the same stories over and over again with only slight variations doesn't make for entertaining reading. Seems like a book that was hastily slapped together with no thought toward narrative or structure. I really only liked the people's stories,that's it though. I skipped all of the front section of the story and moved to chapter three. I then skipped most of the last part. It did get boring when I wasn't reading the stories. I read most of the book, but it was very repetitive and more of a collection of historical accounts. It was nothing special, and the book was very disorganized. I do not recommend this book unless you really don't mind reading hundreds of first-hand accounts. One of the world's greatest stories, has kept the world fascinated for 100 years. This collection of accounts - meh. This was a wonderful read.I would recommend it to anyone who is interested about reading about the Titanic as I do and loved finding out things I hadn't known. Once I got thru the technical stuff ... Brilliant! Interesting first hand accounts, although after awhile it got to be the same old same old tales. Former journalist Tibballs researched & collected first hand stories from the passengers & crew of the ill fated RMS Titanic & brought them all together to make this book for the 100th anniversary of the sinking. And bravo Mr. Tibballs. I thought you did an amazing job. This is one of the best books I have ever read! Lord's A night to remember is much better. An excellent book...although it was very sad to read the accountanof people that were on the ship. A thorough, if at times harrowing series of first hand accounts of the Titanic, it's sinking and the aftermath.